So what do we do now . . . we go a little bit crazy. 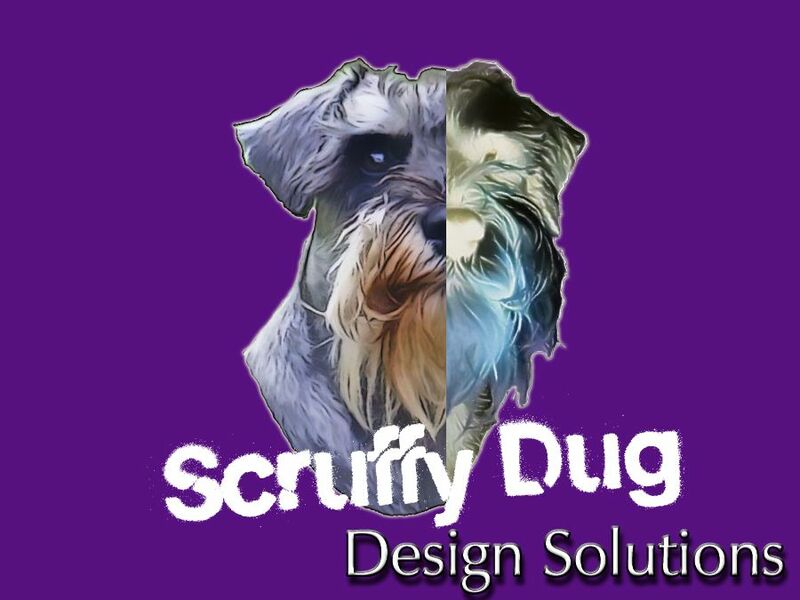 So, if an image of a dog was possibly just going to make us look like a dog services company, then what could I do to an image of a dog to make it look different. 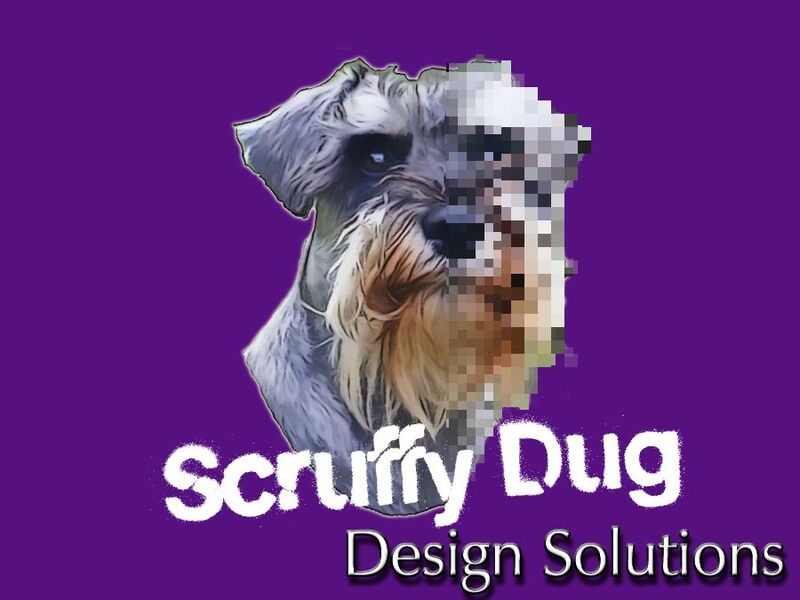 So, firstly I just took the image I’d created from the photo of the Schnauzer, and processed it into metallic colours, the only one of which I liked was the bronze gradient colour set out of photoshop. Which really doesn’t work, it looks less Dog Grooming, but just more . . . bad. So, how could I change the image up to show it wasn’t all about the dog. So I took the image, and sliced it up, lowering the resolution of each slice so the image would slowly, slice by slice become more pixelated and blocky. This communicates (fairly poorly) that the image is both art and digital, but requires too much explaining to get that message across, whereas a logo should be distinctive, and/or get it’s message across easily and quickly. While I was thinking digital, I came up with this little guy. 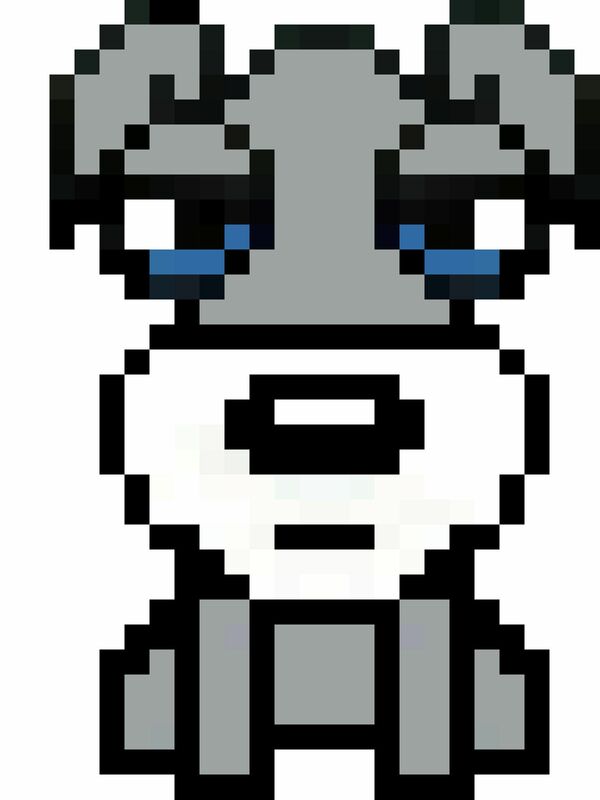 8 Bit video game Dug. Anyway, one last attempt at altering the processed image, so I just inverted the colours of half the image. An effect which leaves me cold, but was worth trying. So, what are we going to do now. 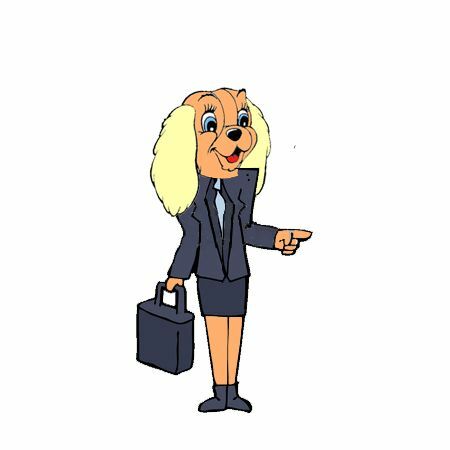 The core of the problem, is that any plain picture of a dog, is going to look like a pet grooming company, whether it’s plain, cartooned, or anything. So how do we connect the image to what we’re doing. So Catherine suggested, cartoon dogs, but operating computers, holding clipboards, taking notes, doing office type things. 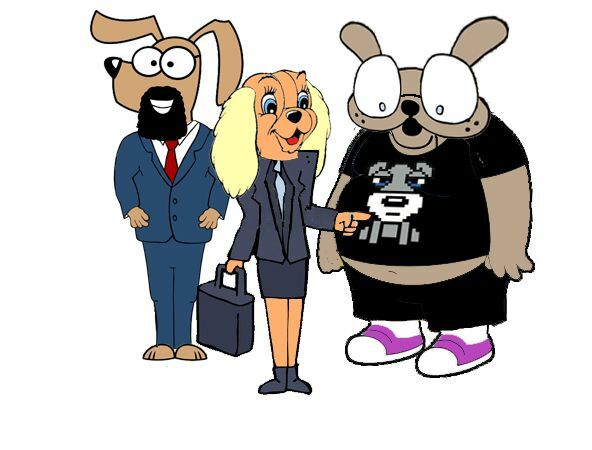 An idea which was quite appealing, but I countered with . . well why the hell not cartoon dog representations of the three of us. As mentioned before, I’m not a great freehand artist, so I took artwork by other artists, and used the parts like jigsaw pieces to create the following. Unusable of course, but it made us laugh hard late in the afternoon. 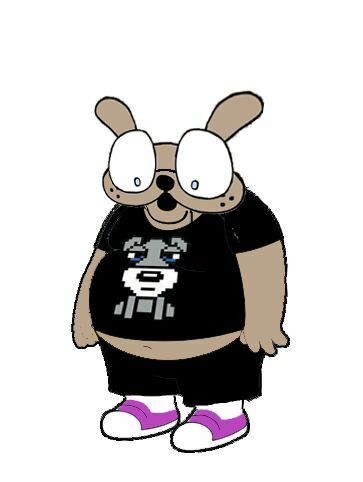 If we took this idea further than this crude prototype, then we would need to draw our own artwork (instead of piece of Simpsons, and Disney dogs). 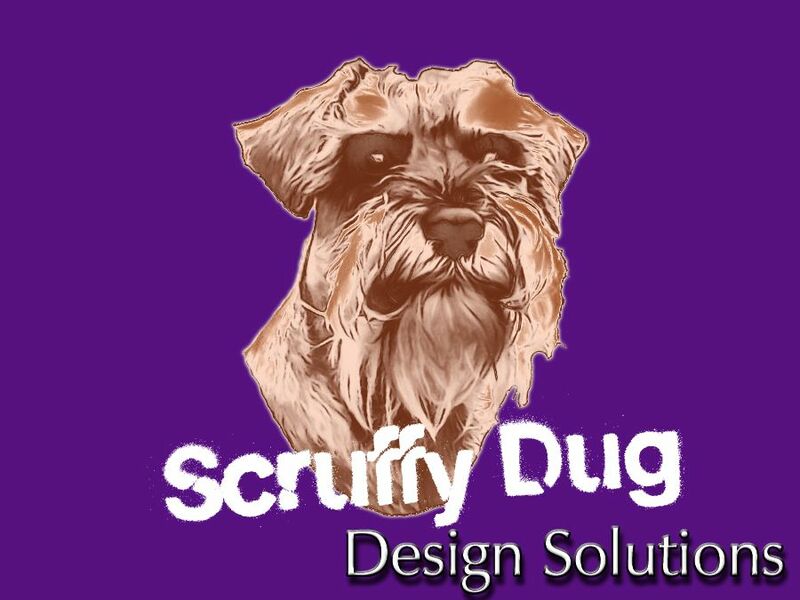 The idea each of us could have our business cards, with the cartoon version on one side with our contact details, and the group shot with the company name on the other, seemed unique, but ultimately we felt it didn’t communicate professionalism, and looked as if Catherine Dog was poking Me Dog in the belly. So, back to Roberts drawings tomorrow, as I’ve got an idea of what we can do with those. Previous PostPrevious In which it occurs to us we’ve maybe made a massive mistake! Next PostNext In which sanity takes us a little too far near normality for our own good!